It has been said that the greatest secrets are always hidden in the most unlikely places – and this time around there’s a huge secret hidden in the Uptown reels where you’ll find our newest Secret Symbol slot! The Aztec Chief is the Wild symbol in this 25 payline slot and when landing 3 or more scattered Pyramids will have you playing the free game feature. With every free spin there’s a new prize multiplier up to 20 times your bet! 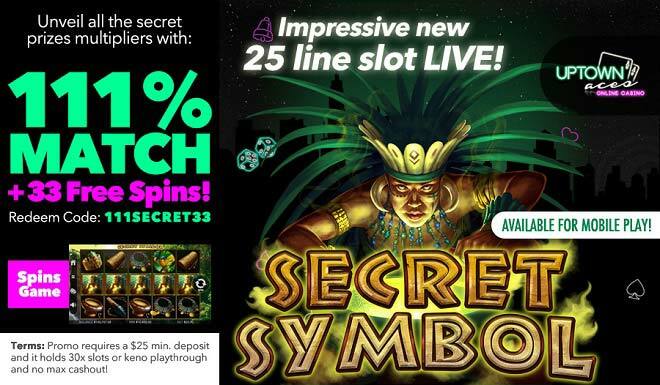 Uncover secret prizes when depositing as little as $25 and win more with a 111% Match + 33 Free Secret Symbol Spins! Promo requires a $25 min. deposit and it holds 30x slots or keno playthrough and no max cashout!